It's not so long ago that, in England and Wales at least, the fire services were responsible for ensuring that landlord fire regulations were adhered to. That was easy for all concerned – the experts who assessed your property were the same people who have to deal with any fires, so it made sense. But now the responsibility has shifted to the landlord, and some have incurred heavy fines for putting tenants at risk and not conforming to fire regulations which they now have to study and understand. In one case a landlord received a £10,000 slap on the wrist, not for not conforming to the fire regulations, but for not keeping the right records to show that they had done so! This all started with the Regulatory Reform Fire Safety Order 2005, otherwise known as RRFSO. One of the good things about this piece of legislation, introduced on 1st October 2006, was that it brought together a lot of disparate and sometimes contradictory regulations. It also introduced the concept of a ‘responsible person’ to make sure that the fire regulations are adhered to. In the case of rented accommodation this is usually the landlord. They now need to perform regular fire risk assessments to assess risk and then implement any changes necessary, and keep records to show what's been checked and what's been done. The fire risk assessment is an extra burden for landlords in terms of time but there's not meant to be any specialist knowledge required. One aim of RRFSO was that accommodation could now be assessed by the people who knew the properties best. But there is also a danger that it would be beneficial to unscrupulous landlords to under-assess the risk to avoid costly alterations. Here we will take landlords through the basics of fire assessment but it must be pointed out that the regulations and their implementation are subject to change, and it is vital for landlords to make sure they understand current requirements. First look at all potential sources of combustion. Those that spring immediately to mind are ovens, hobs and fires, but what about electrical appliances? And it's not just irons and kettles, which naturally get hot when used, but others that shouldn’t too. With rented accommodation the tenants will probably change quite regularly. This means you can't make assumptions e.g. if you have a group of four fit young professionals, you don't have to make provisions for people who are less mobile. So make sure that fire exits and safety devices work for everyone. Take stock of everything that comes up in those first two steps and do something about each one. Many of these are common sense, such as fire alarms and putting fire blankets near cookers. Instigate a file where you can keep records of all your assessments and actions. You should add to this a plan which states how fires and escapes should be handled, identifying exits and assembly points. This should be displayed prominently in homes of multiple occupation (HMO) but with family properties simply make sure it is with other documentation regarding the property and draw tenants attention to it when they take up residence. Go through this whole process regularly to make sure everything is up-to-date. One of the snags with RRFSO is that landlords are told that regular reviews are necessary, but not how regularly! So pragmatic guesswork comes in. For student lets, for example, an annual review just before new tenants come in would seem to make sense. Or if you change the property, perhaps extending it, re-do the assessment cycle then. So what are the things that you need to be looking for, and the safety changes that you need to make? There's much play on the fact that most of the assessment can be considered common sense but you can be sure that no two people's assessment of a property will be the same. The most important thing is to make sure that regular and detailed assessments are kept up and recorded. Here we will give some examples of the sorts of things a landlord needs to look at. But you must be aware that these are only examples and should not be considered a complete list by any means. Heat sources - look at all sources of heat and make sure they are removed, if unnecessary, or protected. Include places where combustible materials are stored, and places where a fire could start and smoulder unnoticed for some time. 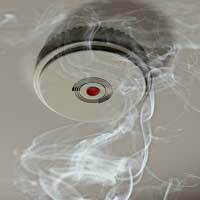 Alarms – smoke alarms are an absolute minimum and a fire alarm system, linked to the fire and safety authorities, should be considered. Fire exits – these should be clearly marked and kept clear at all times. If locked they should use locks that will allow opening from the inside. Fire doors – these, which block the spread of fire, are now mandatory in HMOs (House with Multiple Occupants) and should be considered for other types of rented accommodation too. Access – make sure that people who are less mobile will be able to reach and use fire exits. At all stages of the process you should be recording what you see and what you do about it. It is vital that you are able to provide written proof that you have done everything that the regulations require. Don't forget that you, as the 'responsible person' will be in the firing line without the necessary documentation in place.